To create a niche in the field of Mechanical Engineering through education and research to develop a sound human resource by nurturing the young talents especially from the North Eastern States and also from other states of India, matching the global standards and demands. To create an environment for providing balance education in Mechanical Engineering through teaching, learning and practice rendering equal weightage in all. To create a centre of excellence in research that will provide the students necessary impetus for future development and life-long learning. To create technical manpower in different levels for the North Eastern States in particular and for the country in general. The Department of Mechanical Engineering offers courses to train students in the art of servicing, maintenance and trouble shooting aspects in certificate levels; to impart supervisory skills to the diploma module students. The course curriculum for the degree module is at par with the premiere institutions of the country. Moreover, the laboratories (12 Nos.) and the workshops (06 Nos.) are fully equipped with advanced equipments and machines. The department has well-qualified (Ph.Ds and Post graduates from reputed institutes like IITs, ISM, NITs, J.U, etc. ), experienced as well as young motivated faculty members and supporting staffs to train the manpower according to the need of modular pattern. The relationship is warm and friendly. 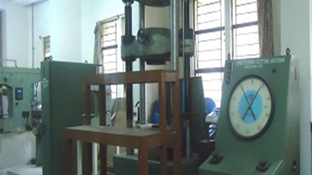 Strength of materials lab is equipped with the various machines related with the materials testing. This include universal testing machine (for tensile and compression test), impact testing machine and hardness testing machine. Copyright© 2016 NERIST. All Rights Reserved.